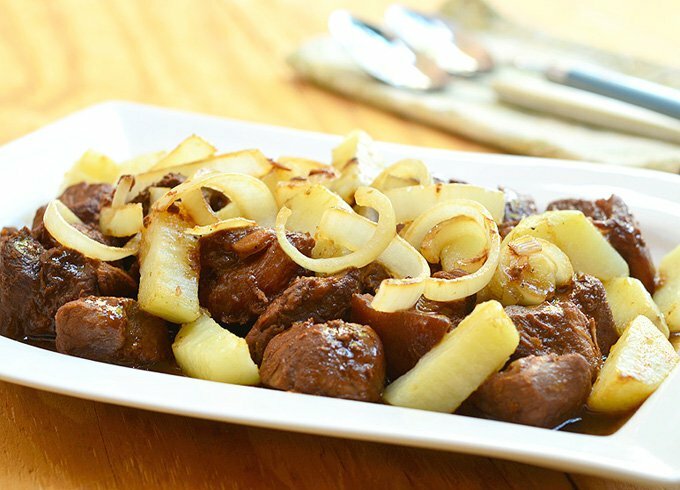 Awesome recipe from the Philippines. In a pot over medium heat, combine pork, soy sauce, lemon juice, and water. Bring to a boil, skimming any scum that floats on top. Lower heat, cover and simmer until pork is tender. With a slotted spoon, remove meat and set aside. Reserve liquid. In a pan over medium heat, heat oil. Add onions and cook for about 30 to 45 second or until half-cooked. Remove from pan. Add potatoes and cook until tender and lightly browned. If you like you can add carrots and tomatoes, fry them until half cooked. Remove from pan. Add pork and cook until lightly browned. Remove from pan. Remove the excess oil from pan. Add reserved liquid and pork. Bring to a boil. Season with salt and pepper to taste. Continue to cook for about 5 minutes or until liquid is slightly reduced. Serve with potato wedges or rice.